Been awhile since ive been here, but i saw this..
could have sworn ive seen in the transmissions. bdh - I saw this story and link as well. 'Kilroy was here' is a common meme that shows up in graffiti for various reasons. All conincidence, I think. heart of China, more than 100 kilometers north of Mianyang. thirty miles from its only nearest town, Akmeqit. from the border with Kyrgyzstan. the saints..." The phrase Orate pro nobis is Latin for "Pray for us." Sands Missile Range in New Mexico. and Ham Capital of the World (a reference to the pigs, surely). The third set of coordinates is for the Almaty airport in Kazakhstan. dropping pigs down a mine shaft or something too. clip of this image on the 2nd April 08 ad rather than their own clean version. BDH (crossposted on April 2, 2008 as well) : They are indeed mine - I was an idiot and drew on the copy I made, and then wound up scanning it in. And it is indeed interesting to see that one get re-used with my writing on the April 2, 2008 page. matters tend to have exotic belief systems. Re: Perkins comments on numbers stations. frequencies listed in ads that have been linked with numbers stations. for you: WHAT BELIEF SYSTEM IS _NOT_ EXOTIC? In response to Near a Terminal's question, may I suggest David Broder's? In all seriousness, that question has less rhetorical effect than it seems you imagine. to the screen twice as 3:10 to Yuma (1957 film) and 3:10 to Yuma (2007 film). is the top of another Ad isn't it? find the dagger handle with the 51.53N picture in the 1988 Mayday page. My friend has several ideas regarding the triangle. 2. It has to do with locolocation. 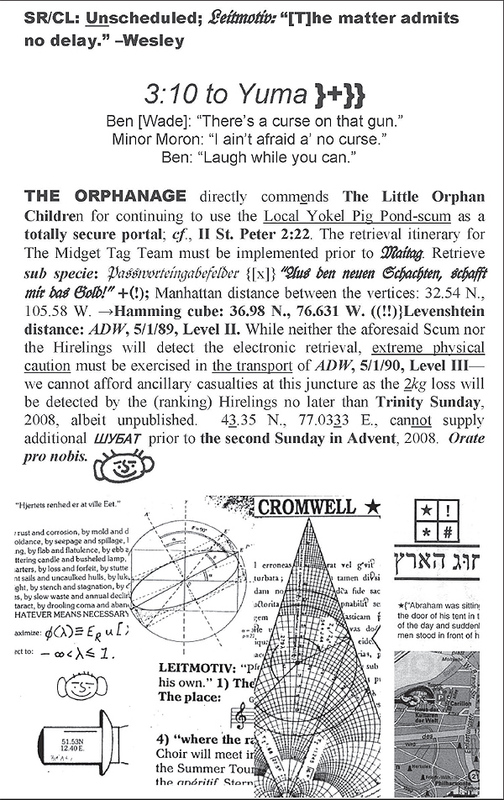 "The Orphanage directly commends The Little Orphan Children"
This plainly means that the two are in in fact separate /in some manner/. The word right above the smiley face is in Russian and means a Kazakh drink made from camel's milk called shubat. If you go to the second set of coordinates in streetview, very nearby there is a metal (?) pig outside the entrance to Windsor Castle Park, which is an obvious repeated theme.